Filed to: will they order American takeout?Filed to: will they order American takeout? will they order American takeout? Tonight will bring the first NBA meeting of Houston's Yao Ming and the player expected to be the next Chinese NBA star, Milwaukee's Yi Jianlian, an occasion that could draw the largest global audience to see an NBA game. The game will be on 19 networks in China, including CCTV-5, Guangdong TV, Guangzhou TV, and ESPN Star Sports in Hong Kong and Taiwan. It also will be available live through two Webcasters. Though ratings estimates in China are difficult and vary widely, today's game is said to be certain to draw 150 million viewers and could reach 250 million. CCTV-5 alone is available in 210 million households. Fun fact: It will also be the first NBA game to include players from six continents. Sorry, Antarctica! But as AA wonders, will anyone in the U.S. care? (it's not even being shown nationally here). Is David Stern's globalization of the NBA really becoming the soccerization of the NBA? Not for me. 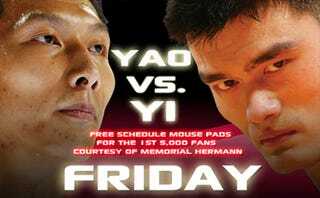 I haven't been this excited about a matchup since Bruce Lee vs. Kareem Abdul-Jabbar in Game of Death.